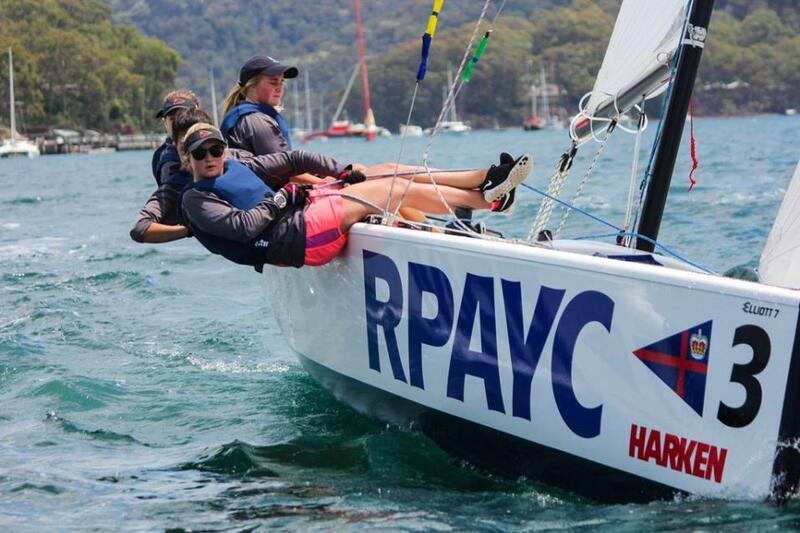 The Royal Prince Alfred Yacht Club’s 2014 annual 22nd HARKEN International Youth Match Racing Championships finals will take place over Pittwater this weekend. 13 teams from Australia, New Zealand and New Caledonia have been competing in a “Round Robin” style of match racing using 8 brand new Elliott 7m class boats that belong to the RPAYC. Coming into the event, Sam Mckay, according to the International Sailing Federation (ISAF) was the highest ranked sailor with a ranking of 78. George Anyon has been a dark horse this year as he was a crew member from last year’s winning team skippered by Chris Steele. Being his first HARKEN event as a skipper he continues to impress the field by defeating the top 5 seeded skippers in the event so far. 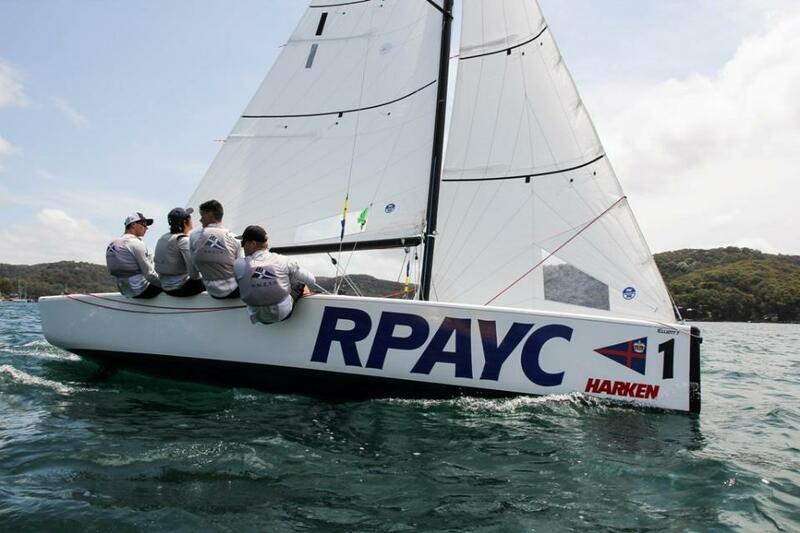 Regatta favourite, Harry Price, CYCA at only 19, is also performing strongly in the event. Harry, whose sister won silver in the 2012 London Olympics for match racing, had a comfortable start and sits with the Kiwis on 9 wins. The results have been tight with the top 8 teams being very close together in their standings, Jenna Walters, co-ordinator for the event is very happy with the outcome. RPAYC sailor, Milly Bennett, is sailing strongly, with lighter breezes on day 2 helping Milly and her all female crew to an equal 3rd position with 3 other competitors. Milly’s team is one of the only all female team in the mixed gender event, Milly likes the challenge the boys bring. Ted Anderson, National Race Officer, has been doing a great job co-ordinating the race course throughout the round robin racing. The weather looks promising for the weekend finals ahead with a hot day forecast for Sunday. By Stephen Collopy, RPAYC Media. A steady 15-18 knot NE sea-breeze provided the perfect opening day of racing for the RPAYC HARKEN international Youth Match Racing Regatta with 50 paired races making it one of the biggest day’s racing in the history of this regatta. George Anyon, from the Royal New Zealand Yacht Squadron is becoming the one to watch in the year’s regatta. Having won the event last year as a crew member to skipper Chris Steele made George a bit of a dark horse having not skippered a boat in the event. George and his crew managed to win 7 of their 8 races, they lost their only race to fellow Kiwis, Sam Mackay and his team from Royal Port Nicholson Yacht Club. Sam has the highest ranking in this year’s event with an ISAF ranking of 78. Regatta favourite, Harry Price from the CYCA, whose sister won silver at the London 2012 Olympics for match racing had a very comfortable start winning 5 matches from 6. Harry’s team lost to Sam Ellis and his team from Gosford Sailing Club (GSC) who won 6 from 8 for the day. RPAYC sailor, Clare Costanzo showed she was one of the best female skippers of the day winning 5 from 8 races. Clare and her team were very competitive in their matches having only just lost to George Anyon in a very narrow race. The end of day 1 saw some very exciting match ups with the Kiwi teams with skippers Sam Mackay and George Anyon leading, both are sitting on 7 wins out of 8 matches. Followed closely by Harry Price (CYCA) sitting on 5 wins from 6 matches. Even though all 3 teams have only lost 1 race, percentage wise the Kiwis sit higher with an 88% win where Harry sits on 83% as he has completed only 6 matches. Day 2 on the water is predicted to be a hot day with the mercury predicted to reach 36 degrees Celsius and variable winds. With a change of wind direction and strength it will be exciting to see who will shine today. Today was a completely different day from yesterday, unsteady weather made it “extremely frustrating” to set the course, the constant wind shifts and stoppages made racing very slow, only completing 24 races as opposed to 52 on the first day. The Kiwi teams are again on top of the leader board after day 2 of racing. Sam Mackay (RPNYC) and George Anyon (RNZYS) are sitting high and dry with 9 wins out of 11 races. George is still proceeding to impress the field by defeating the top 5 seeded skippers. Sitting on equal 3rd with 3 other competitors, RPAYC sailor Malcolm Parker was feeling much better about today’s racing. Another RPAYC sailor, Milly Bennett, also fighting for a 3rd spot had an exciting win against Sam Ellis in one of the match ups. The lighter breezes seemed to have favoured the all female crew. Even though 2 races haven’t been completed due to the wind dropping off in the late afternoon, based off the maths, all but one of the top 8 seeded teams will be advancing to the quarter finals. After 2 days of solid racing it is still anyone’s game, the strength in field shows that anyone could win it and it will make for an exciting finals series. The forecast has predicted the weather to be a little more stable for day 3. If you want to keep up with the live updates, click the links below. The last flight of the round robin was completed this morning with a surprise upset by Emma May (CYCA) defeating the event leader George Anyon (RNZYS) in light and shifty conditions. Also Harry Price (CYCA) completed his round robin defeating Sam McKay (RPNYC) which has pushed Harry up to equal first position with the teams from New Zealand. The racing between the top 4 teams has been very competitive and very close. RPAYC’s Milly Bennett commented on close quarter final against GSC Sam Ellis. “It was all about the starts today and today you needed to make sure you had the lead-in leeward position approaching the start line from then on it was all about trying to stay in phase with the wind and trying not to separate too much from your opponent.” Said Milly. 4 teams from separate clubs will be going against each other in what some are saying is an ANZAC test with 2 teams from New Zealand to 2 from Australia. It is forecast to be a hot day with a stiff sea-breeze in the afternoon which see some very exciting racing! Article and pictures by Stephen Collopy, 2014.